Understanding different types of bank accounts and its types is essential before opting for a specific account based on your need. After Demonetization, banking has become necessary for our day to day life. So, Let us understand the basics first. What is a bank deposit? A bank deposit is made when cash is deposited into any banking institution. A customer can open any kind of account as per your need by submitting KYC documents. The bank will open a customer information file called as CIF Number before opening any account. CIF Number contains all the information you provided in account opening form as well as kyc documents that you submitted. The account holder has the right to withdraw the deposited cash, as per the terms and conditions agreed upon. What are those 4 Types of Bank Accounts? This account is meant for individuals who want to park funds for a short period of time. Savings Bank Account carry 3.5-6% Interest Rate on a daily balance basis. This is different for each bank. RBI no longer stipulates interest rate on Savings accounts. Prior to 24/10/2011, RBI is the authority to decide interest rates on savings bank accounts. Nowadays, private banks like Kotak Mahindra & Yes Bank are offering 6% interest rate. Most of the banks are implementing the minimum balance charges, which means if you don’t maintain a specified balance on a monthly average basis, you have to pay certain fees as a penalty for not maintaining the required minimum balance requirement. Most of the banks have rules for the maximum number of withdrawals in a period and the maximum amount of withdrawal, but hardly any bank enforces these. However, banks have every right to enforce such restrictions if it is felt that the account is being misused as a current account. Tax Implications: Interest earned up to Rs.10,000 in a financial year on Saving Bank accounts is exempted from tax under Section 80TTA. Deductions under Section 80TTA apply only to individuals or Hindu Undivided Families. If the total interest is above Rs.10000, you have to pay tax as per the income tax slab you come under for the amount that exceeds Rs.10000. These accounts are also known as demand accounts. Current Accounts are basically meant for businessmen and are never used for the purpose of investment or savings as there is no interest paid on these deposits. There are no limitations on the number of transactions in a day or the amount either. Money can be withdrawn using a debit card, over-the-counter withdrawal slips or checks. Besides not paying interest on the deposits made in those accounts, banks charge certain kinds fees for proving facilities like checkbooks, unlimited transactions, etc. The difference between the current account and savings account is the rate of interest and number transactions allowed. Tax Implication: Needless to say that there will be no tax liability as there is no interest paid on these deposits. Popularly known as FD accounts, every bank in India offers these deposit schemes for periods ranging from 7 days to 10 years. They are also called as Term Deposits. This type of bank account is opened by a customer who has money to invest and earn more interest. Traditionally, Interest rates offered are higher than the savings bank accounts. FD’s can be opened with single or joint names. Nomination facility is also available. Interest rates on these deposits are declared by individual bank management based on the prevailing interest rates in the banking system. Currently, interest rates on fixed deposits are ranging from 5-7% based on the tenure and the bank. Below, I have posted the State Bank of India (SBI) Interest Rates On Retail Domestic Term Deposit. 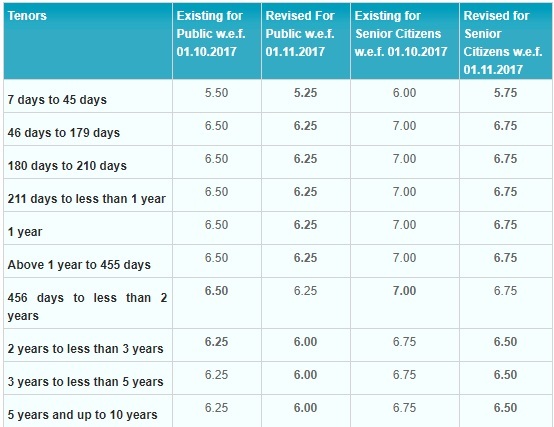 Please check latest SBI Fixed Deposit Interest Rates. You will have the option to close the deposit prematurely and withdraw cash in emergency situations. Also, you can avail loan on these deposits by paying some extra interest over and above the fixed deposit interest rate. Usually, Loan interest rate will be 1-2% above the FD Interest rate. Tax Implications: Interest earned on these deposits is fully taxable. Banks will deduct TDS at the rate of 10% on the interest earned if the interest income for the year is more than Rs. 10,000 on the total number of deposits you made on a cumulative basis. If your total income is below the basic slab, you don’t need to pay tax. You have to pay tax as per the income tax slab you come under. To avoid deduction of TDS, you have to submit the PAN Card and 15-G or 15-H to the bank. Form 15G is meant for non-senior citizens whereas Form 15H is meant for senior citizens only. Please remember that you should submit 15-G or 15-H, only when your total income is below the basic tax slab combined with the interest income. Please note that, if you have not submitted PAN Card and 15-G or 15-H to the bank, the bank will deduct 20% TDS. Popularly known as RD accounts, and are most suitable for those account holders who do not possess a lump sum amount in savings. Those who earn monthly income can invest certain fixed amount on a monthly basis. Interest is paid on the amount already deposited via monthly installments. Usually, interest rates applicable to Fixed deposits are applicable to RD’s. Unlike fixed deposits, where the deposit is accepted for 7 days, RD’s tenure ranging from 6 months to 120 months. With this type of account, the account holder must deposit a fixed amount monthly (which can be as little as 100INR per month). If this is disrupted, a penalty fee will be extracted or the maturity period will be increased depending on the bank. Nowadays, some banks are offering a flexible/variable RD. Under these flexible RDs, the person is allowed to deposit above the minimum stipulated while opening an account, with an upper limit fixed for the same e.g. 10 times of the minimum amount agreed upon. A passbook is typically issued in which the person can get the entries for all the deposits made by him to know the balance in the account. Premature withdrawal of accumulated amount is permitted. However, a penalty may be imposed for early withdrawals. RD’s can be opened in single or joint names. Nomination facility is also available. You can fund this account by availing Standing Instruction facility. In this case, bank withdraws a fixed amount on a fixed date of the month from the savings bank of the customer (as per his mandate), and the same is credited to RD account. Tax Implications: With effect from 1st June 2015, TDS would be deducted @10% under Section 194A. The rules are just like Fixed Deposit Accounts. Nowadays banks are offering different kinds of bank accounts which combine the features of SB, Current and Fixed Deposits. No-Frill Accounts: – These accounts are also known as Zero Balance accounts. These types of bank accounts are usually opened customers who are having income below Rs.50000 per annum. But some banks are offering zero balance accounts to all customers. No-frills account comes with certain restrictions on deposit and withdrawals, which vary from bank to bank. Monthly Interest Payout Fixed Deposit Accounts: – Banks call this type of fixed deposit scheme with different names. But the main feature of this deposit scheme is that the interest on the deposit will be paid on monthly basis/intervals on the discounted value, to meet the monthly requirement of funds by a depositor. Interest-Bearing Checking Accounts: – Most banks refer to such an account as an interest-bearing checking account, Checking Plus or Advantage Accounts. These accounts merge the characteristics of both the checking and savings accounts, permitting account holders to easily access their money but also earn interest on their deposits. Now you know different types of bank accounts in India, the rate of interest offered on these deposits and the tax implications. I have also highlighted the advantages and disadvantages of different accounts. So, What are you waiting for? Go Save! Develop Discipline in Savings! You can check out my upcoming posts to know how to open bank account online.